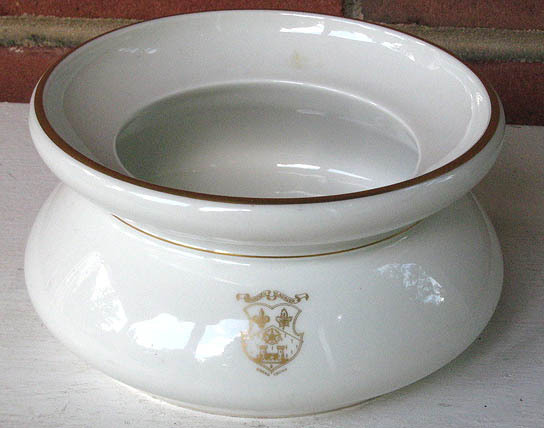 Spittoons or cuspidors were once a fixture in hotel lobbies, railroad stations, and other public places, reflecting the widespread tobacco habits of days gone by. Their construction tended toward a low profile and heavy weight, reflecting the fact that no one wanted to deal with the results of one of these things being accidentally kicked or tipped over. 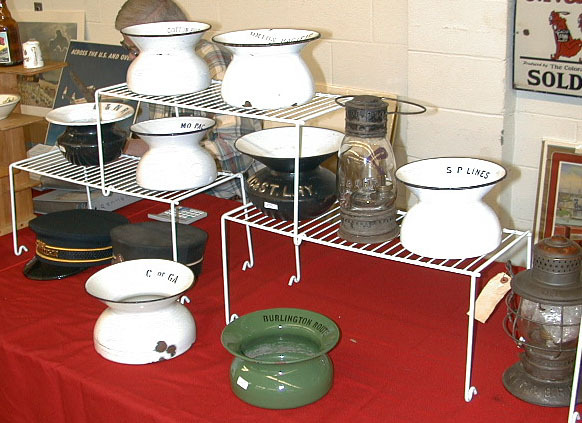 In today's railroadiana market, railroad-marked spittoons are fairly rare but can be found at many of the larger shows. 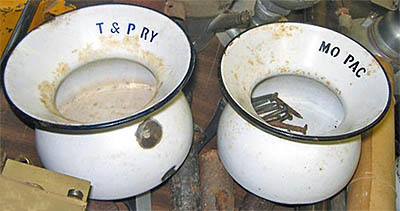 The typical profile of a railroad-marked spittoon can be seen in the pictures below. All of these spittoons have a rather similar shape. The railroad markings are simple initials and are incorporated into the finish or cast into the piece itself. Click on any image for a larger version. 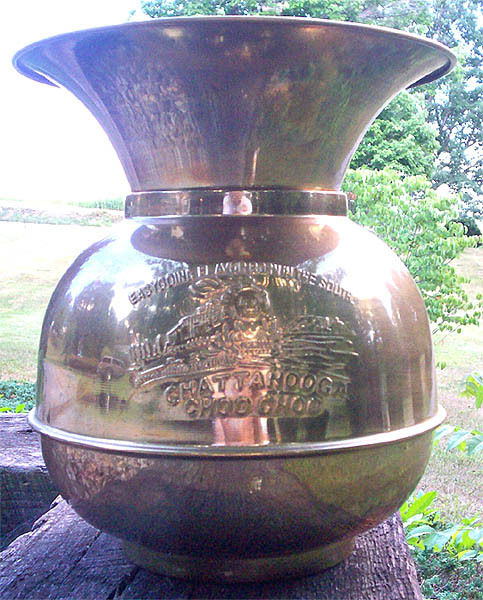 A particularly ornate spittoon is the Grand Trunk (Railway) System example shown below. 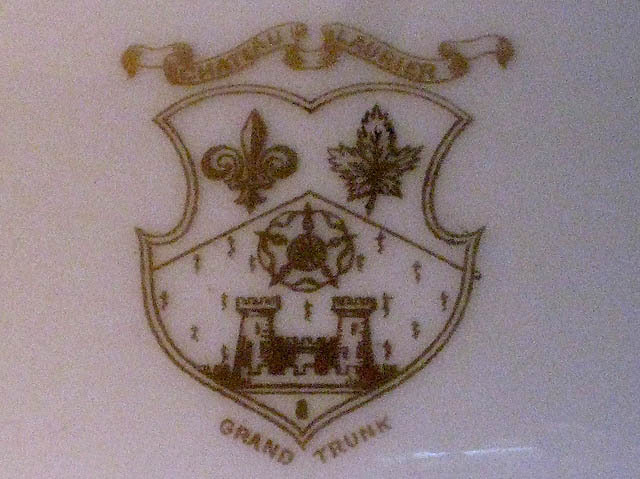 It is unusual in that it is made of china and has an elegant crest instead of plain railroad initials. 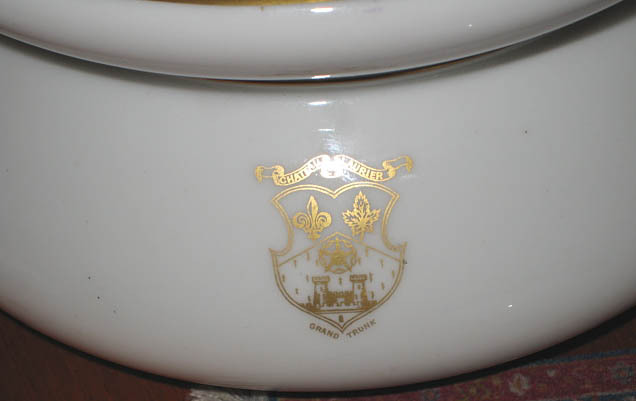 The backstamp is shown in the last image. Click on any image for a larger version. 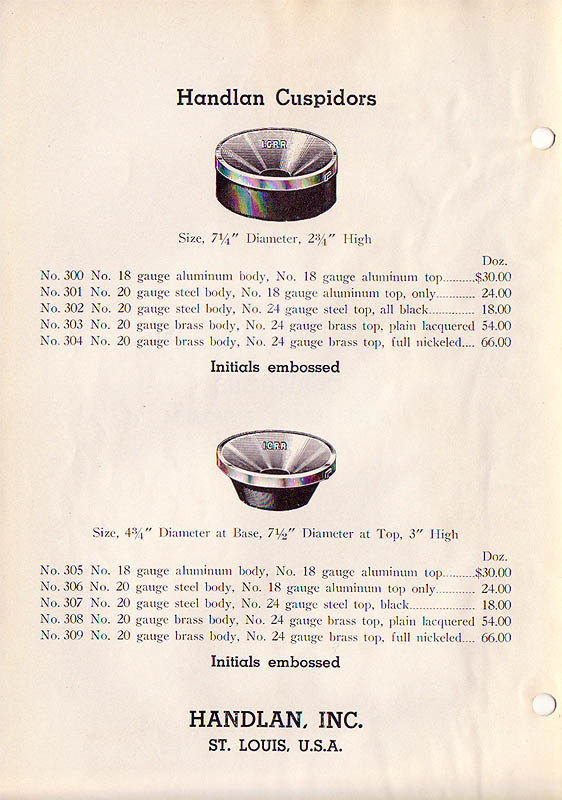 The scans below illustrate how spittoons appeared in catalogs of the Handlan Company (AKA the Handlan-Buck Company), a prominent supplier of small railway equipment. 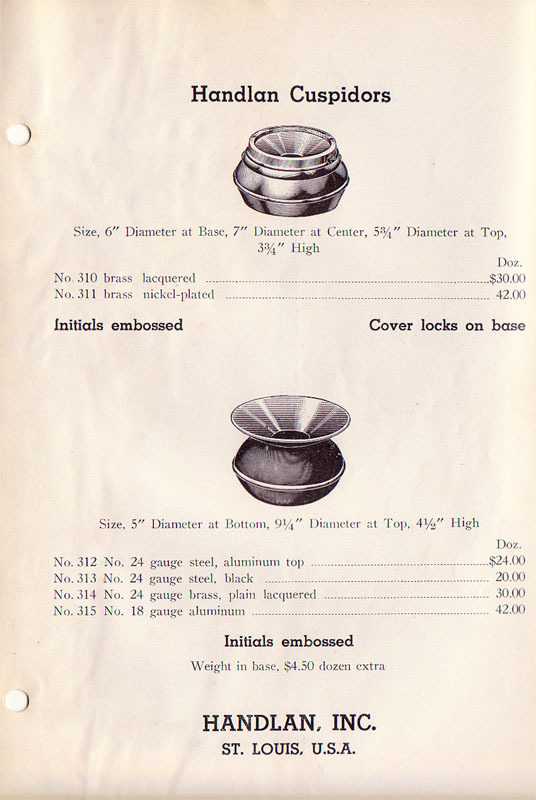 At left is an illustration from the 1893 catalog; at middle and right are illustrations from a 20th century (1930's or 1940's?) catalog. Again note the general profile of these items. Click on any image for a larger version. 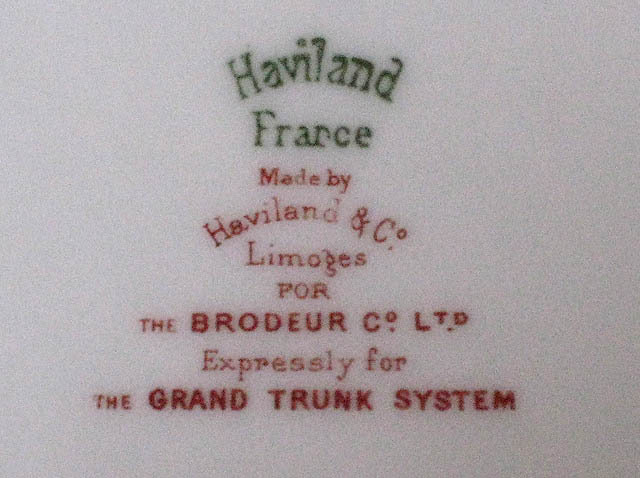 There are possibly other markings as well, and some versions include an embossed locomotive along with the marking. 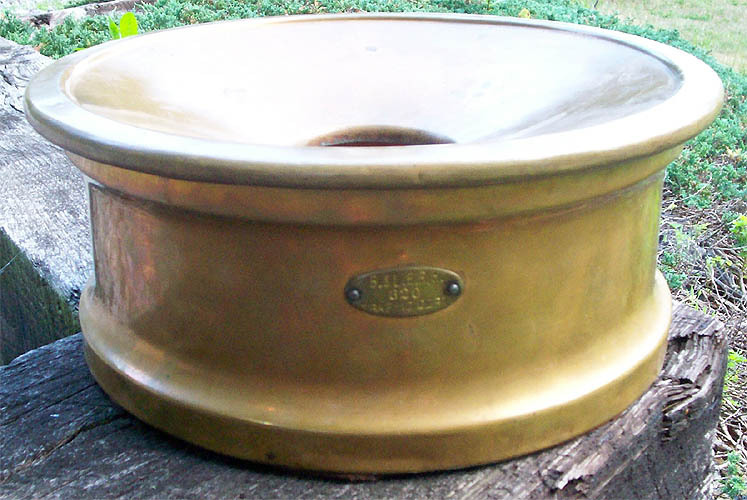 All of the spittoons in this style are unanimously considered by railroad historians and collectors to be fakes -- brass imports brought into North America within the last several decades. They may not be very recent in manufacture, and some show considerable weathering, wear and deterioration. Of course this deterioration is often cited as evidence of authenticity, but it is really due to either poor construction or poor brass quality. A typical example is shown at upper right, and another is shown at lower right. The photographer who shot the fake at lower right says that he still has the plastic bag that it came in, complete with a sticker for $18.98 from a well-known store that carried railroad-themed novelty items. 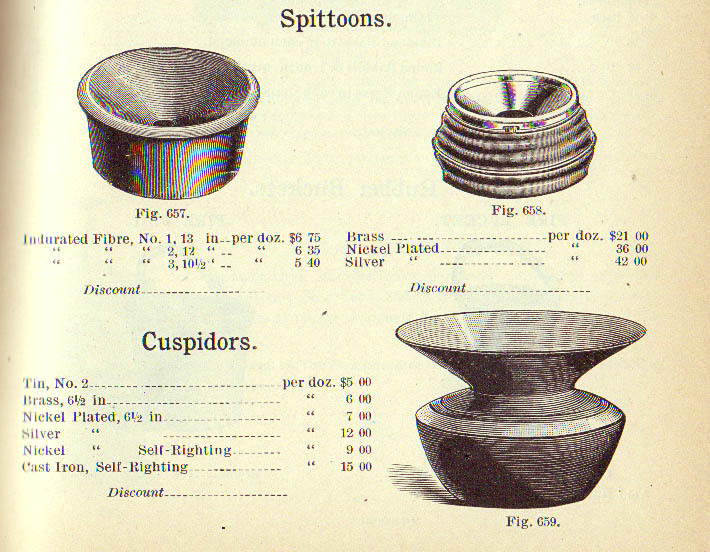 Note the shape of the two fakes -- more like a vase than the low-slung, authentic spittoons shown in the photos and catalog illustrations above. Imagine how easy it would be to kick one of these over and why any company making such items for real use would not be in the business for long. It's not clear exactly when these were imported and/or if they are still being imported. But they are likely to be in the market for decades to come, and it's a certainty that novice collectors will continue to be fooled. Thanks to the photographers who supplied photos shown on this page!